_Sailfish and Marcel Zamora Sponsors of the Open Water. The German franchise presents “The Festival”, a renewed format of the CHALLENGE SALOU. This event, which goes hand by hand with the CHALLENGE FAMILY, will offer a series of activities for participants and their families on the 25th, 26th and 27th of May. The main objective of the festival is to accommodate the triathlete’s companions so that they can participate and enjoy the different activities throughout the weekend. “The Festival” will start on the afternoon of the Friday 25th of May with the opening of the EXPO and with a masterclass of Zumba performed by the monitors from Club Tenis Salou H20. SAILFISH OPEN WATER will be taking place on the Saturday 26th of May at 8am, a new test sponsored by the great Marcel Zamora, a five times champion of the IronMan of Nice (France), where he will be swimming a circuit of 1,9km around Salou’s beach also known as the beach of Europe. Next activity taking place would be the CHALLENGE BREAKFAST RUN at 10am, a 4km solidarity run suitable for competitors and companions of Sundays triathlon as well as people from the area. The following hour, there would be a race for the younger audience, The KIDS RUN. At 12pm, a briefing will take place in English and Spanish which will be followed by the PASTA PARTY. Saturday’s activities will conclude with the CHALLENGE WOMAN, an exclusive race just for women. 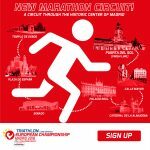 The main event CHALLENGE SALOU, will be taking place on the Sunday 27th of May. At exactly 7am will begin the HALF distance (1.900m of swimming + 90km of cycling + 21km of running) in a revitalized circuit of three faster laps and closer to the spectators. 30 minutes later the SHORT distance will take place including (1.900m of swimming + 60km of cycling + 11km of running) which returns due to petitions of the public after 2 years of absence. Finally, at 7:35h, the AQUATHLON will take place including (1.900m of swimming + 11km of running). CHALLENGE SALOU has confirmed the first PRO’s at the exit line for this year’s edition. The 2018 winner, Sara Loehr, the Belgian Sofie Goos and the Spanish Maria Pujol from the Female’s category. from the male’s category, Emilio Aguayo, second finalist from 2017 edition, Pablo Dapena, which will be facing his fourth consecutive challenge and finally, the winner of the 2016 edition, Iñaki Baldellou.